The GA# 9 in the title indicates that this was one of the first books written by Rudolf Steiner. Its first English edition was published in 1910, which indicates how important this book was. Most of Steiner’s other books were compilations of his transcribed lectures which did not get translated into English until the 1960s. In this book Steiner gives us detailed descriptions of the spiritual world which are invaluable to understanding the remainder of his many works. At one point he mentions that this book could be considered as an introduction to his magnum opus, An Outline of Occult Science. 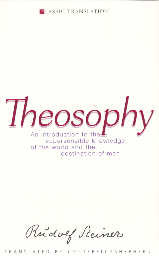 I first read Theosophy in 1996 and wrote a short review of it here. Later that year I read Occult Science and did a short review of it here. Now, after reading over 150 other Steiner books, I am re-reading Theosophy. I have felt at times that I had missed something along the way. Now I know what I had missed: this book — a deeper reading of it. Reading it again has filled out many lacunae in my own understanding of Steiner's works, and I encourage all newcomers to Steiner to read it early and late in your studies as it will provide a solid basis for understanding the rest of his writings. Steiner tells us in this Preface (1922) about the difficulty of writing and reading descriptions of the spiritual or supersensible world. Be prepared to spend more time reading this book than you would any other kind of book, even an ordinary science book describing details of the sensory world. [page 7, April, 1922] Descriptions of the supersensible world must be treated differently from descriptions of the sensible. They appeal to the reader in a different way. They demand more from him; he must work with the author, in thought, more intensely while he is reading. The author needs his co-operation to a far higher degree than does one who writes descriptions drawn from the regions of the sense world. Many critics will perhaps complain, because I have made special efforts to comply with this demand in my description of the spiritual world. The spiritual world, however, has not the defined outlines of the physical; and if anyone were to represent it so as to give the impression that this was the case, he would be describing something false. In describing the spiritual world of facts, the style must be in accordance with the mobile, flowing character of that world. Steiner battles with the dilemma posed by the lack of defined outlines of the spiritual world and the presence of defined outlines in the words he uses to describe the spiritual world. He will pause from time to time in his lectures to remind his audience of this challenge they face. This is part of the demand he places on us the readers of his works today. The other challenge is that we are English readers and all of his written works and lectures were in German. There is a filter between what we read and what Steiner wrote or spoke. There are two translations of this classic book available and I have both of them, so that I can read one and use the other book as a cross reference or guide to another view of the original German. I will share at least one passage with you so that you may read for yourself the difference in two translations of one passage(1). You will see the basis on which I claim that I chose the better of the two translations for my re-reading of this important book in the collected works of Rudolf Steiner. When one studies Rudolf Steiner, one must leave behind forever the insidious notion that the real world consists only of those things we perceive with our sensory organs of perception. Imagine if a blind person claimed that light didn't exist because she had never seen it. There are fish in underwater lakes in Kentucky whose eyes have disappeared because no light reaches them. There is an organic give and take between our perception and the world around us. Our eyes came to be because of the irritation of light on our heads led to their formation in order to perceive the source of the irritation Likewise our ears came into being because there was noise. Likewise our ears came into being because there was noise. But the spiritual world impinges not upon our human physical bodies and thus produces no stimulus for us to form perceptual organs to perceive the spiritual world. The stimulus for such organs must come from within the human being by a voluntary act. As blind people might be encouraged by reports of those who see to undergo a procedure to allow them to see the physical world, so might we be encouraged by Rudolf Steiner to undergo a procedure to perceive the spiritual world. And that longing is not enough on its own. It can, however, act as the root from which the plant and later the blossom may form. [page 8, Preface, April 1922] It would however be a mistake to suppose that the ideas of the supersensible world arise, as an illusion, out of this longing. The lungs do not create the air for which they long, neither does the human soul create out of its longing the ideas of the supersensible world. But the soul has this longing because it is formed and built for the supersensible world, as are the lungs for the air. The soul, thus being built for the supersensible world, can not have evolved by the processes described by Darwinians in their evolutionary scheme which has humans evolving from the animal kingdom. Try to imagine a scenario in which the human soul could have evolved from a fish, or a platypus, or a brachiating monkey. The human lungs could have, but not the human soul. It is for this reason that one must in all honesty make a sharp distinction between the animal kingdom and the human kingdom. No one argues that plants vary sharply from minerals, that plants vary from animals, but because the distinction requires an organ of perception which most humans do not have, there is much argument about the distinction between animals, especially higher primates, and human beings(2). So, is it hopeless for us to read about the supersensible world, if we currently are unable to perceive it? Quite to the contrary, according to Steiner. [page 8, Preface, April, 1922] There is no need to be a painter in order to feel the beauty of a picture. Yet only a painter can paint it. Just as little is it necessary to be an investigator in the supersensible in order to judge of the results of supersensible research. One can speak to seasoned travelers of places they have never been, such as Tuva or Timbuktu, and they will be able to visualize such an exotic place because they have been to other places almost as unusual. But try to describe Tuva, a remote country in Asia, to a poor Appalachian family who has never been outside of their tiny mountain village, and they will have great difficulty comprehending the life in Tuva. They might even ask for proof that such a place exists whereas the seasoned traveler would not. Steiner has no problem speaking to investigators into the spiritual world, but he must also speak to those who know nothing of the spiritual world. How can he possibly expect them to understand him? Because every human being has an inherent feeling for the truth. Steiner talks of a hypothetical observer of the supersensible world in this next passage, so he is himself the "he" written of in this next passage. [page 12, 13] He knows that even those who are still far from the moment when first-hand spiritual investigation will be possible for them can bring to meet him a measure of understanding. For the feeling for truth and the power of understanding it are inherent in every human being. And to this understanding, which can light up in every healthy soul, he addresses himself in the first place. He knows too that in this understanding there is a force which, little by little, must lead to the higher grades of knowledge. This feeling which, perhaps, at first sees nothing at all of what is related, is itself the magician which opens the eye of the spirit. In darkness this feeling stirs; the soul sees nothing, but through this feeling is seized by the power of the truth; and then the truth will gradually draw nearer to the soul and open in it the higher sense. In one person it may take a longer, in another a shorter time, but everyone who has patience and endurance reaches this goal. For although not everyone born blind can be operated on, every spiritual eye can be opened, and when it will be opened is only a question of time. [page 13] Erudition and scientific training are not pre-conditions for the unfolding of this higher sense. It can develop in the simple-minded person just as in the scientist of high standing. Indeed, what is often called at the present time 'the only true science', can, for the attainment of this goal, be frequently a hindrance rather than a help. For this science naturally allows only that to be considered real which is accessible to the ordinary senses. And however great its merits are in regard to the knowledge of that reality, yet when it decrees that what is necessary and healthful for itself shall also apply to all human knowledge, then it creates at the same time a host of prejudices which close the approach to higher realities. [page 14] . . . but one cannot, in the full sense of the word, be 'man' without having, in some way or other, come nearer to an understanding of the nature and destination of man as revealed through the knowledge of the supersensible. Next he reveals the origin of the word "theosophy" to us and how its use fits in with his preferred term "spiritual science"(4). [page 15] The Highest a man is able to look up to he calls the Divine. And in some way or other he must think of his highest destination as being in connection with this Divinity. Therefore that wisdom which reaches out beyond the sensible and reveals to him his own being, and with it his final goal, may very well be called 'divine wisdom' or theosophy. To the study of the spiritual processes in human life and in the cosmos, the term spiritual science may be given. When, as is the case in this book, one extracts from this spiritual science the particular results which have reference to the spiritual core of man's being, then the expression theosophy may be used for this domain, because it has been employed for centuries in this direction. Steiner begins this chapter with a long quote from Goethe which directs our attention to three aspects of being human. First there are the objects which surround us and the information which flows from them through our senses. Second there are the impressions which this information makes upon us — whether we like one, dislike another, find one useful, another harmful, etc. Third there are the secrets of their activities and being which reveal themselves to us. (Page 18) These are three distinct, easy-to-understand areas of our human lives which anyone can grasp, and yet they form the essence of the human being as body, soul, and spirit. For a long time as I was studying Rudolf Steiner's works, my wife and copy-editor kept asking me, "What exactly does he mean by 'soul'?" and I was at a loss to explain the term "soul" simply and succinctly to her, up until now. The soul is the part of us that comprises the impressions which our sensory apparatus in its operations leaves upon us. Note that sensory data is necessarily transient — it exists only in the moment and then disappears. But sensory data leaves traces inside of us which we cannot share with another human being. We cannot tell them such a simple thing as what the color red looks like to us, for example. All we can do is point to an object we see as red and say "I see that as red." We can agree with others that the object is what we call red, but we can never unfold for them the color that we see inside of us(5). Always our agreement on a color must revert to the external sensory fields. 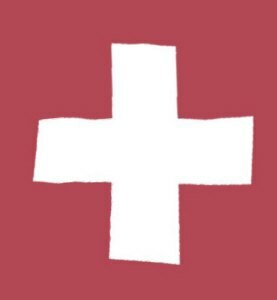 Our individual reaction therefore to the color red is something that is accumulative over the course of our lifetime in a human body and everyone has a different life history and therefore a different reaction to the color red. If we now generalize from a single color to all colors, and from colors to other visualize stimuli, and from visual to auditory, smell, taste, and kinesthetic stimuli, we can grasp how a single human being accumulates a huge range of impressions from the sensory world, and all of these impressions are idiosyncratic and private, incapable of being directly shared except by conversion outward and partially into sensory data again, so far as we know. This is the realm of the soul, the private part of ourselves upon which the sensory data that play upon us in the moment are stored as permanent impressions. [page 18] These three legions are distinctly separate in human life. And man thereby becomes aware that he is interwoven with the world in a threefold way. The first way is something that he finds present, that he accepts as a given fact. Through the second way he makes the world into his own affair, into something that has a meaning for himself. The third way he regards as a goal towards which he has unceasingly to strive. This is how Steiner makes the case for a human being consisting of body, soul, and spirit. He derives the existence of the body, soul, and spirit directly from everyday observable facts which do not require some ancient text or dogma for one to accept as being true. One can grasp their significance from one's circadian experience. One cannot proceed further in the study of spiritual science if one does not understand how every human being consists of body, soul, and spirit. This next paragraph in particular must be carefully considered before proceeding into this book or other works of Steiner. [page 19] Thus man continually links himself in this threefold way with the things of the world. One should not for the time being read anything into this fact, but merely take it as it stands. There follows from it that man has three sides to his nature. This and nothing else will for the present be indicated here by the three words body, soul, and spirit. Whoever connects any preconceived opinions, or even hypotheses with these three words will necessarily misunderstand the following explanations. By body is here meant that through which the things in man's environment reveal themselves to him; as in the above example, the flowers of the meadow. By the word soul is signified that by which he links the things to his own being, through which he experiences pleasure and displeasure, desire and aversion, joy and sorrow in connection with them. By spirit is meant that which becomes manifest in him when, as Goethe expressed it, he looks at things as a 'so to speak, divine being'. In this sense the human being consists of body, soul and spirit. Perhaps those of you who have known people who objected to Steiner's writings can now understand that the source of their objections stemmed in whole or in part from their preconceived notions of body, soul, and spirit acquired through other texts, dogmas, or beliefs. It is hard to explain to objectors how simple it is to study Steiner's work compared to studies which they cite as disagreeing with Steiner. Yet it merely requires them to read the above paragraph to clarify in their own minds what comprises body, soul, and spirit. This is basic foundation of Steiner's spiritual science, the sturdy rock which holds up the rest of the structure. [page 22] I can perceive with my bodily senses the red table which another person also perceives; but I cannot perceive his sensation of red. Sensation must therefore be described as belonging to the soul. If we grasp this fact alone quite clearly, we shall soon cease to regard inner experiences as mere brain processes or something similar. Feeling is closely allied to sensation. One sensation causes man pleasure, another displeasure. These are stirrings of his inner, his soul-life. In his feelings man creates a second world in addition to that which works on him from without. And a third is added to this — the will. Through the will man reacts on the outer world. And he thereby stamps the impress of his inner being on the outer world. The soul of man as it were flows outwards in the activities of his will. The actions of the human being differ from the occurrences of outer nature in that they bear the impress of his inner life. Thus the soul as that which is man's very own stands in contradistinction to the outer world. He receives from the outer world the incitements, but he creates in response to these incitements a world of his own. The body becomes the foundation of the soul-being of man. [page 23] Nature subjects man to the laws of metabolism, but he subjects himself to the laws of thought. By this means he makes himself a member of a higher order than that to which he belongs through his body. And this order is the spiritual. The spiritual is as different from the soul as the soul is different from the body. Steiner gives us a view of the soul as being intermediary to the body and the spirit. This concept may be difficult for those who have been indoctrinated by a religious dogma which dropped the concept of "man as body, soul, and spirit" around the ninth century(6). [page 23, 24] As long as we speak only of the particles of carbon, hydrogen, nitrogen, and oxygen which are in motion in the body, we have not got the soul in view. The soul-life begins only when within the motion of these particles, the feeling arises: 'I taste sweetness' or 'I feel pleasure'. Just as little have we the spiritual in view as long as we consider merely those soul-experiences which course through a man who gives himself over entirely to the outer world and his bodily life. This soul-life is rather the basis of the spiritual just as the body is the basis of the soul-life. The scientist, or investigator of nature, is concerned with the body, the investigator of the soul (the psychologist) with the soul, and the investigator of the spirit with the spirit. To make clear to oneself through thought upon and observation of one's own self the difference between body, soul, and spirit, is a demand which must be made upon those who seek by thinking to enlighten themselves regarding the nature of man. To paraphrase that difficult last sentence: It is essential that we clearly think upon and observe in ourselves the difference between body, soul, and spirit if we are ever to understand the nature of our humanity. To those interested in the nature of the human being, Steiner's views as stated succinctly above, even with their complex syntax, are actually easier to assimilate than the confused remnants of religious and metaphysical dogma with which we have been burdened for over a millennium. We have eyes for seeing and ears for hearing and these organs accept the input which reaches them from physical or mineral world. But when minerals are taken up into a plant’s body, all we can see as natural scientists is the minerals’s organization in our microscopes. If we have no organ of perception for the life force which organizes the minerals into a living plant, we are as blind to that force as eyeless people are to the mineral world itself. Steiner was born with such an organ of perception and used it, as any scientist would, to describe the world he saw with it. He could see the life force, and knew that was possible for people to learn to see the life force. Thus, he needed a name for the life force in order to talk about it and describe the role it plays in human nature. [page 26, 27] Man does not perceive the manifestations of the life-force through the ordinary senses. He sees the colors of the plants; he smells their perfume; the life-force remains hidden from this form of observation. But the ordinary senses have just as little right to deny that there is a life-force as has the man born blind to deny that colors exist. Colors are there for the person born blind as soon as he has been operated upon; in the same way, the objects, the various species of plants and animals created by the life-force (not merely the individual plants and animals) are present to man as objects of perception as soon as the necessary organ unfolds within him. An entirely new world opens out to man through the unfolding of this organ. He now perceives, not merely the colors, the odors, etc., of the living beings, but the life itself of these beings. In each plant, in each animal, he perceives, besides the physical form, the life-filled spirit-form. In order to have a name for this spirit-form let it be called the ether-body, or life-body(7). The etheric body, as it is usually called today, is one of the four bodies of the full human being, namely, the physical body, the etheric body, the astral body, and the "I" or Ego body. The usage of the word "body" should be clearly understood to be as adding nothing in and of itself to the form of any of the four bodies. Steiner himself makes that clear in his discussion of the human etheric body. Note especially that while animals and plants have etheric bodies, it is only in humans that the etheric body is designed to serve the function of thinking. [page 28] The etheric body of man differs from that of plants and animals, through being organized to serve the purposes of the thinking spirit. Just as man belongs to the mineral world through his physical body, he belongs through his etheric body to the life-world. After death the physical body dissolves into the mineral world, the ether-body into the life-world. By the word 'body' is denoted that which gives any kind of being shape or form. The term 'body' must not be confused with a bodily form perceptible to the physical senses. Used in the sense implied in this book the term 'body' can also be applied to such forms as soul and spirit may assume. Even though a man with an organ of perception can observe the etheric body in action, he cannot observe when a person perceives the sensation of a color. From this Steiner derives the existence of the sentient soul. [page 29] If I were able to observe the ether-body, I should see how the physical brain-process is at the same time a life-process. But the sensation of blue colour, which the recipient of the rays of light has, I can find nowhere in this manner. It arises only within the soul of the recipient. If, therefore, the being of this recipient consisted only of the physical body and the ether-body, sensation could not exist. The activity by which sensation becomes a fact differs essentially from the operations of the formative lifeforce. It is an activity by which an inner experience is called forth from these operations. Without this activity there would be a mere life-process, such as is to be observed in plants. If one pictures a man receiving impressions from all sides, one must think of him at the same time as the source of the abovementioned soul-activity which flows out from him to all the directions from which he is receiving the impressions. In all directions soul-sensations arise in response to the physical impacts. This fountain of activity shall be called the sentient soul. This sentient soul is just as real as the physical body. If a man stands before me, and I disregard his sentient soul by thinking of him as merely a physical body, it is exactly as if I were to call up in my mind, instead of a painting — merely the canvas. Similarly he derives the existence of the intellectual soul and consciousness soul. The sentient soul exists in animals, but they have no intellectual soul, only humans do. This is another justification for the sharp distinction between the animal kingdom and human kingdom, which some materialistic natural scientists inadvertently obfuscate(8). [page 32] Through the sentient soul man is related to the animal. In animals, also, we observe the presence of sensations, impulses, instincts and passions. But the animal obeys these immediately. They do not, in its case, become interwoven with independent thoughts, transcending the immediate experiences. This is also the case to a certain extent with undeveloped human beings. The mere sentient soul is therefore different from the evolved higher member of the soul which brings thinking into its service. This soul that is served by thought will be termed the intellectual soul. One could also call it the mind-soul. The intellectual soul permeates the sentient soul. He who has the organ for 'seeing' the soul sees, therefore, the intellectual soul as a separate entity, in relation to the mere sentient soul. The intellectual soul is intertwined with the sensations and passions, but there is a part of us that can free itself from all of these, and that can be called the consciousness soul, the "soul within the soul". [page 34] By causing the self-existent true and good to come to life in his inner being, man raises himself above the mere sentient soul. The eternal spirit shines into it. A light is kindled in it which is imperishable. In so far as the soul lives in this light, it is a participant of the eternal. It unites therewith its own existence. What the soul carries within itself of the true and the good is immortal in it. Let us call that which shines forth in the soul as eternal the consciousness-soul. We can speak of consciousness even in connection with the lower soul-stirrings. The most ordinary everyday sensation is a matter of consciousness. To this extent animals also have consciousness. By consciousness-soul is meant the kernel of human consciousness, the soul within the soul. The consciousness-soul is thus distinguished as a distinct member of the soul from the intellectual soul. This latter is still entangled in the sensations, the impulses, the passions, etc. Everyone knows how at first he counts as true that which he prefers in his feelings, and so on. Only that truth, however, is permanent which has freed itself from all flavor of such sympathy and antipathy of feeling. The truth is true, even if all personal feelings revolt against it. The part of the soul in which this truth lives will be called consciousness-soul. With these three forms grasped we can now understands how Steiner puts together the physical body, etheric body, and astral body (as it appears in the next passage) with the three kinds of soul: sentient, intellectual, and consciousness, and make sense of his observations about people who have a limited development of their intellectual soul. [page 34, 35] Thus three members have to be distinguished in the soul as in the body: sentient soul, intellectual soul, consciousness-soul. And just as the body works from below upwards with a limiting effect on the soul, so the spiritual works from above downwards into it, expanding it. For the more the soul fills itself with the true and the good, the wider and the more comprehensive becomes the eternal in it. To him who is able to 'see' the soul, the radiance which proceeds from a human being because his eternal element is expanding, is just as much a reality as the light which streams out from a flame is real to the physical eye. For the seer the corporeal man counts as only part of the whole man. The physical body, as the coarsest structure, lies within others, which mutually interpenetrate both it and each other. The ether-body fills the physical body as a life-form; extending beyond this on all sides is to be perceived the soul-body (astral form). And beyond this, again, extends the sentient soul, then the intellectual soul which grows the larger the more it receives into itself of the true and the good. For this true and good cause the expansion of the intellectual soul. A man living only and entirely according to his inclinations, his likes and dislikes, would have an intellectual soul whose limits coincide with those of his sentient soul. These formations, in the midst of which the physical body appears as if in a cloud, may be called the human aura. The aura is that in regard to which the being of man becomes enriched, when it is seen as this book endeavors to present it. Do you remember when you first danced with your "I"? Steiner introduces the reality of the "I" by quoting the poet Jean Paul talking of the time when he discovered his "I". Most of us made this discovery before the age of five and therefore have no conscious memory of the event, but we can observe in children under five that they don't use the word "I" much and often say things like "Bobby wants some" to refer to themselves. [page 35, 36] The poet Jean Paul says in his autobiography: "I shall never forget the event which took place within me, hitherto narrated to no one, and of which I can give place and time, when I stood present at the birth of my self-consciousness. As a very small child I stood at the door of the house one morning, looking towards the wood pile on my left, when suddenly the inner vision, 'I am an I' came upon me like a flash of lightning from heaven and has remained shining ever since. In that moment my ego had seen itself for the first time and for ever. Any deception of memory is hardly to be conceived as possible here, for no narrations by outsiders could have introduced additions to an occurrence which took place in the holy of holies of a human being, and of which the novelty alone gave permanence to such everyday surroundings." As the material body is built up from the outside inwards, the "I" Is built up from the inside out by the spirit. As the material world is revealed to us by sensation, so the spiritual world is revealed to us by intuition. In the "I" we have finally reached the never-beginning, never-ending portion of the human being. [page 37, 38] Body and soul yield themselves up to the ‘I’ in order to serve it; but the ‘I’ yields itself up to the spirit in order that the spirit may fill it to overflowing. The ‘I’ lives in body and soul; but the spirit lives in the ‘I’. And what there is of spirit in the ‘I’ is eternal. For the ‘I’ receives its nature and significance from that with which it is bound up. In so far as it experiences itself in the physical body, it is subject to the laws of the mineral world; through its ether-body to the laws of propagation and growth; by virtue of the sentient and intellectual souls to the laws of the soul-world; in so far as it receives the spiritual into itself it is subject to the laws of the spirit. That which the laws of mineral and of life construct, comes into being and vanishes; but the spirit has nothing to do with becoming and perishing. But there is an individualized portion of the spirit that manifests as the "I" — the ego or self of man — that is distinct from the consciousness-soul. [page 38] The spirit develops the ‘I’ from within, outwards; the mineral world develops it from without, inwards. The spirit forming an ‘I’ and living as the ‘I’ will be called Spirit-self, because it manifests as the ‘I’, or ego, or self of man. The difference between the Spirit-self and the consciousness-soul can be made clear in the following way. The consciousness-soul is in touch with the self-existent truth which is independent of all antipathy and sympathy; the Spirit-self bears within it the same truth, but taken up into and enclosed by the ‘I’, individualized by the latter and absorbed into the independent being of the man. It is through the eternal truth becoming thus individualized and bound up into one being with the ‘I’, that the ‘I’ itself attains to eternity. The "I" is the very center of our being of body, soul, and spirit. It resides in our soul with windows to both the physical and the spiritual. There remains now only to uncover the Life-Spirit and the Spirit-Man. These can be thought of the spiritual equivalent of the etheric body and physical body of the human. [page 40] As man takes in the materials of the physical world around him and assimilates them in his physical body, so does he take up the spiritual from the spiritual environment and make it into his own. The spiritual is the eternal nourishment of man. And as man is born out of the physical world, so is he born out of the spirit through the eternal laws of the true and the good. He is separated from the spirit-world outside him, as he is separated from the whole physical world, as an independent being. This independent spiritual being will be called the Spirit-man. Here is Steiner's grand summary of the nine parts of the human being. We humans participate in the world of body, soul, and spirit. Like a living plant, we are rooted in our body to the physical world and our soul is the stalk which reaches up into the spiritual world. (Page 43) That stalk is built up of the nine bodies above as we evolve from the physical world into the spiritual world. At this time in the nascent twenty-first century, we have a fully functioning Intellectual soul and our Consciousness soul has been developing since the fifteenth century. [page 43, 44] This arrangement of the members of man can be expressed in a simplified way, but one entirely consistent with the above. Although the human 'I' lights up in the consciousness-soul it nevertheless penetrates the whole soul-being. The parts of this soul-being are not at all as distinctly separate as are the limbs of the body: they interpenetrate each other in a higher sense. If then one regards the intellectual soul and the consciousness-soul as the two sheaths of the 'I', that belong together, with the 'I', itself as their kernel, then one can divide man into physical body, life-body, astral body, and 'I'. The expression astral body designates here what is formed by soul-body and sentient soul together. This expression is found in the older literature, and may be applied here in a somewhat broad sense to that in the constitution of man which lies beyond the sensibly perceptible. The remaining three highest bodies of Spirit-self, Life-spirit, and Spirit-man are worked on by the 'I' or soul kernel in conjunction with the three lowest bodies of Astral body, Life-body (or Etheric body), and Physical body so that each lower body is permeated with the respective higher body and becomes spiritualized in the higher body. [page 44] Impulses, desires, and passions, etc., arise in the sentient soul, in so far as it is energized from within, before this 'inner' has yielded itself to the Spirit-self. If the 'I', saturates itself with the Spirit-self, then the soul energizes the astral body with this Spirit-self. This expresses itself in the illumination of the impulses, desires, and passions by what the 'I' has received from the spirit. The 'I' has then, through its participation in the spiritual world, become ruler in the world of impulses, desires, etc. To the extent to which it has become this the Spirit-self manifests in the astral body. And the astral body is thereby transmuted. The astral body itself then appears as a two-fold body — in part un-transmuted and in part transmuted. Therefore, the Spirit-self, as manifested in man, can be designated as the transmuted astral body. 5. Spirit-self as transmuted astral body. 6. Life-spirit as transmuted life-body. 7. Spirit-man as transmuted physical body. The soul, Steiner tells us, "is placed between the present and duration. It holds the present for remembrance." Those of us who have older relatives who are in various stages of dementia know how sad it is to watch them unable to remember what happened days, or even minutes earlier. It is as though their soul was on vacation and they were unable to keep the present time in their memory for very long. This often happens to those who have lost someone who was very close to them, especially someone to whom they were devoted for many decades. Unable to deal with their loss directly, it seems to me as though their soul has made it easier for them by turning off their process of remembrance almost entirely. [page 47] My soul would always have to perceive afresh the red of the rose, in order to have it in consciousness, if it could not retain it through remembrance. What remains after an external impression, what can be retained by the soul, can again become a conception, independently of the external impression. Through this power of forming conceptions, the soul makes the outer world so into its own inner world that it can then retain the latter in the memory — for remembrance — and, independent of the impressions acquired, lead therewith a life of its own. The soul-life thus becomes the enduring result of the transitory impressions of the external world. But there are certain impressions we leave upon the world through our own action, some action of our will, which can have a chain-reaction upon the events which follow upon it. These effects are permanent as far as the world is concerned, but yet we may form no conception of the series of events which ensue from our action. Will we ever become aware of the impressions we made upon the world? Is there some feature of the world which provides to us this information as our memory provides us recollections of impressions that the world made on us? [47, 48] What I have done to-day endures for to-morrow; it becomes lasting through the deed, as my impressions of yesterday have become permanent for my soul through memory. When I read the above passage the first thought was of my reviews. Before I began reviewing every book I read, a book was a transitory thing which I read and put aside. I was left with what memories I made at the time, memories which faded over time. But once I have written a review of a book, I have performed a deed in the world which has a lasting effect on the world. There is another aspect of writing a review which involves me going back over the book, examining my marginalia, forming coherent sentences of my thoughts, and writing them into a review format(9). This process of study was one I developed during college, especially for my physics courses. I found if I could write out what my sketchy notes meant, then I really understood the material I had listened to and pondered during the lecture or was studying in my textbook. Steiner is getting at something different and rather amazing. We know that an impression made upon one's senses can return to one as a memory. But, can the results of a deed initiated by one's "I" return to one? [page 48, 49] If one really thinks out what is here being considered, the question must arise as to whether the results of a deed on which the 'I', has stamped its own nature might not retain a tendency to return to the 'I', just as an impression preserved in the memory, revives in response to some external inducement. What is preserved in the memory waits for such an inducement. Could not that which has retained the imprint of the 'I' in the external world wait also, so as to approach the human soul from without, just as memory, in response to a given inducement, approaches it from within? For the time being, Steiner leaves us to ponder the question. He first wants us to focus on the question of what constitutes a memory. Does a memory consist of an identical perception appearing to us today which we experienced yesterday? Steiner says clearly that is not the case. To have a memory of an event which happened in the past is to undergo a process of creating a new image of the event in the present(10). [page 50] The image called forth through remembrance is a new one, and not the old one preserved. Recollection consists in the fact that one can make a fresh mental image to oneself, and not that a former image can revive. What appears again in recollection is something different from the original image itself. These remarks are made here, because in the domain of Spiritual Science it is necessary that more accurate conceptions should be framed than is the case in ordinary life, and indeed also in ordinary science. We have seen that the soul acts as the conduit between the physical world and the spiritual world. This is especially true as far as our memories are concerned. As a fig grower, I know that I can only eat but few of the figs which appear on my tree during a couple of weeks in July. I love to eat figs ripe from the tree, but would have to throw away 90 percent of my annual crop if I insisted upon eating them fresh from the tree. My only recourse is to pick them all fresh, eat some of them daily, and make fig preserves from the rest. With that process I am able to enjoy the figs over the entire course of a year. Our soul does a similar thing with our memories. [page 50] As preserver of the past the soul continually gathers treasures for the human spirit. That I can distinguish what is correct from what is incorrect depends on the fact that I, as a human being, am a thinking being, able to grasp the truth in my spirit. Truth is eternal; and it could always reveal itself to me again in things, even if I were always to lose sight of the past and each impression were to be a new one to me. But the spirit within me is not restricted to the impressions of the present alone; the soul extends its horizon over the past. And the more it is able to bring to the spirit out of the past, the richer does it make the spirit. Thus the soul hands on to the spirit what it has received from the body. The spirit of man therefore carries at each moment of its life a two-fold possession within itself: firstly the eternal laws of the good and the true; secondly, the remembrance of the experiences of the past. What it does, it accomplishes under the influence of these two factors. If we want to understand a human spirit we must therefore know two different things about it: first, how much of the eternal has revealed itself to it; second, how much treasure from the past lies stored up within it. In the science of doyletics, we hypothesize that all events which occur in a human life before five years old are recorded faithfully and are capable of accurate re-enactment given the appropriate stimulus. The traces of these events are called doyles and we refer to them as doylic memories to distinguish themfrom the cognitive or conceptual memories which are normally called simply "memories." These doyles are bodily states and unlike the impressions made after five years old (which as Steiner points out, must be re-created as new images when recalled to memory), doyles are re-created exactly as they were stored. One example is that of speaking. The doyles of speaking are stored before five and contain all the idiosyncratic ways of speaking phonemes of the caregivers which spoke in our presence during that time. Thus it is that orientals who came to the USA after the age of five have difficulty forming the phoneme for "R", for example, often pronouncing it like that of "L". I mention doyles here in this review, because doyles are the experiences stored as abilities which Steiner refers to in the next passage. Doyles are unconscious recordings of original events which can be triggered in the present as abilities such as walking, speaking, writing, in addition to many other things. [page 51] These treasures by no means remain in the spirit in an unchanged form. The impressions man acquires from his experiences fade gradually from the memory. Not so their fruits. One does not remember all the experiences one lived through during childhood while acquiring the faculties of reading and writing. But one could not read or write if one had not had the experiences, and if their fruits had not been preserved in the form of abilities. And that is the transmutation which the spirit effects on the treasures of memory. It consigns whatever can merely lead to pictures of the separate experiences to their fate, and extracts from them only the force necessary for enhancing its own abilities. Thus not one experience passes by unutilized; the soul preserves each one as memory, and from each the spirit draws forth all that can enrich its abilities and the whole content of its life. The human spirit grows through assimilated experiences. And although one cannot find the past experiences in the spirit as it were in a storeroom, one nevertheless finds their effects in the abilities which the man has acquired. "Each man is a species for himself." Steiner says on page 54 that anyone who reflects on the nature of biography becomes aware of this fact in respect to the spiritual nature of man. Does this make sense to you? Or rather, how does this make sense to you? [page 53, 54] Were a human being merely a member of a species, no life-history could exist. A lion, a dove, lay claim to interest in so far as they belong to the lion or the dove species. The single being in all its essentials has been understood when one has described the species. The lioness Elsa certainly held great interest to George and Joy Adamson. They wrote a book, "Born Free", about how they raised Elsa from a cub, which gave rise to a movie and a song about 40 years ago. But notice that it was the very involvement of the humans, the Adamsons, which made Elsa stand out from all the other lionesses of Africa. When we tame animals, we anthropomorphize them so that they can take on this very attribute of an individual life-history which characterizes human beings. Elsa's biography was the autobiography of the Adamsons, rightly understood. The events of Elsa's life is not an exception to Steiner's claim above, but rather proves his case. [page 54] It matters little whether one has to do with father, son, or grandson. What is of interest in them, father, son and grandson have in common. But what a human being signifies begins, not where he is merely a member of a species, but where he is a single individual being. I have not in the least understood the nature of Mr. Smith if I have described his son or his father. I must know his own life-history. Anyone who reflects on the nature of biography becomes aware that in respect of the spiritual each man is a species for himself. Those people, to be sure, who regard a biography merely as a collection of external incidents in the life of a person, may claim they can write the biography of a dog in the same way as that of a man. But anyone who depicts in a biography the real individuality of a man, grasps the fact that he has in the biography of one human being something that corresponds to the description of a whole species in the animal kingdom. The point is not — and this is quite obvious — that one cannot relate something in the nature of a biography about an animal — especially clever ones — but the point is that the human biography does not correspond to the life-history of the individual animal but to the description of the animal species. In addition to being a species onto to oneself, each human being has a physical and a spiritual heredity. The concept of a spiritual heredity may require a leap of faith for some Readers, but remember faith is always a voluntary act. Faith is a room one enters cautiously — and leaves the door open for a ready escape. [page 55] As physical man I spring from other physical men, for I have the same shape as the whole human species. The qualities of the species, accordingly, could thus be acquired within the species through heredity. As spiritual man I have my own form as I have my own life-history. I can therefore have obtained this form from no one but myself. And since I entered the world not with undefined but with defined soul predispositions, and since the course of my life, as it comes to expression in my life-history, is determined by these predispositions, my work upon myself cannot have begun with my birth. I must, as spiritual man, have existed before my birth. In my forefathers I certainly did not exist; for they as spiritual human beings, are different from me. My life history is not explainable through theirs. On the contrary, I must, as spiritual being, be the repetition of someone through whose life-history mine can be explained. This is a delicate argument which requires some pondering to get at the matter. Consider carefully the difference between aptitude and faculty in the passage below. [page 55, 56] In order to observe these relations correctly, one must acquire a perception of how there are impressions operating in human life, whose influence upon the aptitudes of the soul is like standing before a deed that has to be done, in contrast to what has already been practiced in physical life. But the soul does not bring faculties gained in this immediate life to meet these impressions, but aptitudes which receive the impressions in the same way as do the faculties acquired through practice. Anyone who penetrates into these matters, arrives at the conception of earth-lives which must have preceded this present one. He cannot in his thinking stop at purely spiritual experiences preceding this present earth-life. As I understand it, an aptitude is a natural predisposition towards some skill or knowledge sprung full-blown, whereas a faculty is something which must cultivated over a long period of time. If one arrives in this life with an aptitude, one can understand it best as a faculty which was cultivated over a long period of time before this lifetime. Steiner perceives the need for a specific example at this point in his argument and provides it with Friedrich Schiller, the famous eighteenth century German author. [page 56] The physical form which Schiller bore, he inherited from his forefathers. But just as little as Schiller's physical form can have grown directly out of the earth, as little can his spiritual being have arisen directly out of a spiritual environment. He must himself be the re-embodiment of a spiritual being, through whose life-history his own will be explicable, just as his physical human form is explicable through human propagation. In the same way, therefore, as the physical human form is again and again a repetition, a re-embodiment, of the distinctively human species, so too the spiritual human being must be a re-embodiment of the same spiritual human being. For, as spiritual human being, each one is in fact his own species. Here we have Steiner's basic argument for reincarnation laid out for us. It does not require proof, but it does require thinking. It is a voluntary act which one will only accept when one is convinced that it explains the facts of human life as one knows it better than any other explanation. Science per se offers no explanation for how humans arrive at birth with such dispositions as Mozart, Schiller, Goethe, or Rudolf Steiner, for that matter, did. [page 56, 57] It might be objected to what has been stated here, that it is a mere spinning of thoughts; and such external proofs might be demanded as one is accustomed to demand in ordinary natural science. The reply to this is that the re-embodiment of the spiritual human being is, naturally, a process which does not belong to the domain of external physical facts, but is one that takes place entirely in the spiritual region. And to this region no other of our ordinary powers of intelligence has entrance, save that of thinking. He who will not trust to the power of thinking, cannot in fact enlighten himself regarding higher spiritual facts. For him whose spiritual eye is opened, the above trains of thought act with exactly the same force as does an event that takes place before his physical eyes. In this next passage on Geothe's heredity Steiner gives us a glimpse of his sense of humor in the last sentence. [page 58] True, the soul as such leads a complete life of its own; it shuts itself up with its inclinations and disinclinations, its feelings and passions. But as a whole it is nevertheless active, and therefore this whole comes to expression also in the sentient soul. And because the sentient soul inter-penetrates and as it were fills the soul-body, the latter forms itself according to the nature of the soul and can in this way, as the bearer of heredity, pass on inclinations, passions, etc., from forefathers to children. On this fact rests what Goethe says: 'From my father I have stature and the serious manner of life, from my mother a joyous disposition and the love of telling stories.' Genius, of course, he did not receive from either. In this next passage Steiner expands a bit on the aptitude and faculty argument he made earlier on pages 55, 56. One's attitude towards something no doubt depends on whether one encounters it for the first time or not. [page 59] When the human spirit meets with an experience similar to one to which it has already been linked, it sees in it something familiar, and is able to adopt a different attitude towards it from the one it would adopt if it were facing it for the first time. This is the basis of all learning. And the fruits of learning are acquired capacities. The fruits of the transitory life are in this way graven on the eternal spirit. Special abilities of a specific human being can either be seen as a miracle or fruits of spirit. To a spiritual scientist these are seen as fruits of the spirit. [page 60] The human spirit is its own species. And just as man, as a physical being belonging to a species, transmits his qualities within the species, so does the spirit within its species, that is, within itself. In each life the human spirit appears as a repetition of itself with the fruits of its former experiences in previous lives. Steiner has clearly shown that ordinary observation fostered by correctly oriented thinking leads us inevitably to the conception of repeated earth lives. (Page 61) One needs to adopt new terminology, once the matter is rightly understood, which allows one to talk of the time between death and a rebirth as well as the time between birth and death. Death has lost its sting when it is understood as a transition between life in a physical body and life in the spirit. In his final summary below, Steiner adds an important detail about whether we meet in some future life the people we know in this one. The answer he gives is a definitive "Yes" — because those people, with which we have karmic issues created or left unresolved in this life, must re-appear in our next life to resolve or balance the karmic issues. [page 66, 67] The physical body is subject to the laws of heredity. The human spirit, on the contrary, has to incarnate over and over again; and its law consists in its bringing over the fruits of the former lives into the following ones. The soul lives in the present. But this life in the present is not independent of the previous lives. For the incarnating spirit brings its destiny with it from its previous incarnations. And this destiny determines its life. What impressions the soul will be able to have, what wishes it will be able to have gratified, what sorrows and joys shall grow up for it, with what individuals it shall come into contact — all this depends on the nature of the actions in the past incarnations of the spirit. Those people with whom the soul was bound up in one life, the soul must meet again in a subsequent one, because the actions which have taken place between them must have their consequences. When this soul seeks re-embodiment, those others, who are bound up with it, will also strive towards their incarnation at the same time. The life of the soul is therefore the result of the self-created destiny of the human spirit. In Chapter Three Steiner takes us through the three worlds: The Soul-world, The Spiritland, and The Physical World and its Connection with the Soul-world and Spiritland. In additions he discusses the Soul in the Soul-world after Death and the Spirit in the Spiritland after Death. He closes with the Thought-forms and the Human Aura. These subjects will be a stretch for anyone who trusts only in their outer physical senses. A careful reading of this entire chapter, which forms the middle section of this book, will provide a foundation for understanding much of Steiner's later works. [page 68] A man's ability to convince himself of the reality of a thing or a being depends on whether he has an organ of perception, a sense for it. It may, of course, easily lead to misunderstandings if one calls the higher organs of perception 'spiritual senses', as is done here: for in speaking of senses one involuntarily connects with them the thought of the physical. The physical world is in fact designated the sensible, in contradistinction to the 'spiritual'. In order to avoid this misunderstanding, one must take into account that higher senses are spoken of here only in a comparative or metaphorical sense. He quotes Goethe speaking about "Nature's open secret(11)" and we learn to understand colors in the Goethean sense of recording the path, the deeds, the suffering of light which reaches our eyes. This is a completely phenomenal approach to color which contrasts with Newton's more abstract theory of light as composed of all the colors. Goethe focused on what one sees as a specific color while Newton focused on what one might see of all colors. [page 69, 70 Goethe quote] Colors are the deeds of light, deeds and sufferings. . . colors and light are indeed linked in most intimate relationship, but we must think of them both as belonging to the whole of Nature; for through them the whole of Nature is engaged in revealing herself to the sense of the eye especially. In like manner Nature reveals herself to another sense... Nature thus speaks downwards to other senses, to known, mis-known and unknown senses; she thus speaks with herself and to us through a thousand phenomena. To the attentive she is nowhere either dead or silent. Our senses with which we perceive Nature were developed in us by Nature and we accept them as a gift freely received. But to perceive the soul and spiritual worlds, we as human beings must develop our own organs of spiritual perception. Those who claim there are no such organs of spiritual perception are like those who remain in the back of an auditorium and criticize the speaker for not talking loud enough for them to hear. They want the speaker to change so that they won't have to change. But development of these organs require us to change. And it is a natural change because human beings are part of Nature. [page 70] Such a development of the higher organs not yet developed for us by Nature herself is not unnatural; for in the higher sense all that man accomplishes belongs also to Nature. Steiner has made a point that is missed by so-called environmentalists who rail against everything that human beings do as if Nature should be left alone. They would have us believe that Nature would better off if humans had never existed and that humans are not even a part of Nature! [page 71] The development of the soul- and spirit-senses will be spoken of in a more detailed way farther on in this book. Here these higher worlds themselves will be first described. Anyone who denies the existence of these worlds says nothing more than that he has not yet developed his higher organs. The evolution of mankind is not terminated at any one stage; it must always progress. To help us understand the spiritual world rightly is the primary task of Steiner in this book. How do you teach someone about something they cannot already see with their sensory apparatus? One must use similes and metaphors, two of the most powerful tools of human thought. These tools provide a way of seeding knowledge, seeding a way of knowing into those who can later acquire the ability for themselves. [page 73] To begin with, knowledge of the higher worlds must be gained by means of similes. Only then is man ready to acquire for himself the power to see into them. In the sense world we are in the world of Newtonian mechanics where size, weight, movement, and forces are at work. Matter is solid and impenetrable. But in the soul-world, we enter a world in which desires and longings are like objects which surround us. These are as different from what is in our soul as the objects of the physical world which surround us are different from the physical parts of our body. (Page 74) To distinguish the material of the soul-world from the physical world, Steiner introduces the term "astral." [page 74] Impulse, wish, longing, are names for the material of the soul-world. To this material, let us give the name of 'astral'. If one pays more attention specifically to the forces of the soul-world, one can speak of 'desire-reality'. But it must not be forgotten that the distinction between matter and force cannot be as sharply drawn as in the physical world. An impulse can just as well be called force as matter. We learned as children under the age of five how to translate and correlate the maze of colors and lines into coherent images, so we have little idea now of how an adult might deal with the world of vision for the first time. But Oliver Sacks(12) worked with a man named Virgil who was a full-functioning blind person who regained his sight and was turned into a malfunctioning sighted person because he lacked the training in seeing that the rest of us take for granted. Through Virgil’s experiences we can learn about how we each learned to see, to recognize, and to resolve objects out of the bewildering confusion around us. Through understanding how we came to see in the physical world, we can appreciate the difficulty we will encounter when learning to perceive the astral realities of the soul-world for the first time. [page 74] The differences between the soul-world and the physical have a bewildering effect on one who obtains a view of the soul-world for the first time. But that is also the case when a previously inactive physical sense has been opened. The man born blind, when operated upon, has first to learn to guide himself through the world which he has previously known only by means of the sense of touch. Such a man, for example, sees the objects at first in his eyes, then he sees them outside himself, but they appear to him as if painted on a flat surface(13). Only gradually does he grasp perspective and the spatial distance between things, and so on. In the soul-world entirely different laws prevail from those in the physical. Now it is true that there are many soul-formations bound to those of the other worlds. The soul of man, for instance, is bound to the human body and to the human spirit. The occurrences to be observed in it are therefore influenced at the same time by the bodily and the spiritual worlds. This has to be taken into account in observing the soul-world; and one must take care not to claim as a law of the soul-world occurrences due to the influence of another world. When, for example, a man sends out a wish, that wish is brought to birth by a thought, by a conception of the spirit whose laws it accordingly follows. But just as the laws of the physical world can be formulated disregarding, for example, man's influence on it, so the same thing is possible with regard to the soul-world. [page 75] The force with which one soul-formation attracts others, seeks to fuse with them, to make its affinity with them effectual, must be designated as sympathy. Antipathy, on the other hand, is the force with which soul-formations repel, exclude each other in the soul-world, with which they assert their separate identity. The part played in the soul-world by a soul-formation depends upon the proportion in which these basic forces are present in it. Steiner presents us with three soul-formations which could be compared to solids, liquids, and gases in the physical world. They are Burning Desire, Flowing Susceptibility, and Wish-Substance. [page 76, solids] It [Burning Desire] attracts other formations in its neighborhood by means of the sympathy ruling in it; but besides this sympathy there is at the same time present in it antipathy, through which it repels certain things in its surroundings. From the outside such a formation appears to be endowed with the forces of antipathy only. That, however, is not the case. There is sympathy and antipathy in it, but the latter predominates. It has the upper hand over the former. Such formations play a self-seeking role in soul-space. They repel much that is around them, and lovingly attract only little to themselves. They therefore move through soul-space as unchangeable forms. The force of sympathy in them makes them appear avaricious, with a greed that seems insatiable, as though it could never be satisfied. . . . This region of soul-substance may be called Burning Desire. [page 77, liquids] The second kind of soul-formation is that in which the two basic forces preserve a balance, in which, accordingly, antipathy and sympathy act with equal strength. They approach other formations with a certain neutrality; they act on them as if related, but without especially attracting or repelling. They erect no solid barrier, as it were, between themselves and their surroundings. They constantly allow other formations in their surroundings to act on them; one can therefore compare them with the fluids of the physical world. And there is nothing of greed in the way in which such formations attract others to themselves. [page 77, gases] The third degree of soul-formation is that in which sympathy has the upper hand over antipathy. Antipathy produces the self-seeking self-assertion; this, however, retires into the background when inclination towards the things around takes it place. Let us picture such a formation within soul-space. It appears as a Wish-Substance. This designation appears to be the right one, for although antipathy, relatively weaker than the sympathy, is there, the attraction works in such a way as to bring the attracted objects within the soul-formation's own sphere. The sympathy thus receives an underlying tone of selfishness. This wish-substance may be likened to the airy or gaseous bodies of the physical world. As a gas strives to expand on all sides, so does the wish-substance spread itself out in all directions. We saw earlier that the soul is the conduit between the physical world and the spiritual world. As we evolve we move away from the physical world and more towards the spiritual world. Our evolution proceeds in the three stages of thought, wish, and deed. The thought appears in the spirit, the soul interprets it as a wish, and the deed is accomplished by the body. As wishes often are expressed in words, we see the progression of thought, word, and deed. Thus are the spirit, soul, and body linked together in life. What happens when the linkage is broken between the soul and the physical body? What happens when the linkage is broken between the soul and the spirit? [page 82, 83] When the body shall die is determined by the laws of the body. Speaking generally, in fact, it must be said it is not that the soul and spirit forsake the body, but that they are released from the body when its forces are no longer able to fulfil the purpose of the human organization. The relationship between soul and spirit is just the same. The soul will release the spirit to pass into the higher, the spiritual world, when its forces are no longer able to fulfil the purpose of the human soul-organization. The spirit is set free the moment the soul has handed over to dissolution what it can only experience in the body, and retains only that which can live on with the spirit. This remainder which, although experienced in the body, can, nevertheless, as fruit be impressed on the spirit, connects the soul with the spirit in the purely spiritual world. The soul resides immediately after death in the Region of Desires, what is known in some religious systems as purgatory. Steiner gives us an example of how the pleasures of the human body are retained in the soul and create suffering in the purgatory state as the after-effects of these pleasures must be purged from the soul. [page 84] The easiest way to gain an idea of the condition in which the soul lives during the time immediately after death is afforded by the following consideration. Let us take a somewhat crass example: the pleasures of the bon vivant. His pleasure consists in the tickling of the palate by food. The pleasure is naturally not bodily, but belongs to the soul. The pleasure lives in the soul as also does the desire for the pleasure. But for the satisfaction of the desire the corresponding bodily organs, the palate, etc., are necessary. After death the soul has not immediately lost such a desire, but it no longer possesses the bodily organ which provides the means for satisfying the desire. The state of the man is now — to be sure, from another cause, but one which acts in the same way only far more strongly — as if he were suffering burning thirst in a region in the length and breadth of which there is no water. The soul thus suffers burning pain from the deprivation of the pleasure, because it has laid aside the bodily organ through which it can experience that pleasure. The second region, Flowing Susceptibility, is the liquid-like region with an equal presence of attracting and repelling. Those who flit through life from one trifle to another as an object of amusement, will undergo suffering until all attachments to such objects have been purged. [page 86, 87] The losing of oneself in the external glitter of life, the joy in the swiftly succeeding impressions of the senses, bring about this condition. . . . If the soul experiences this condition after death without the presence of the physical objects which are necessary for its satisfaction, the condition must needs ultimately die out. Naturally the privation which precedes its complete extinction in the soul is full of suffering. This state of suffering is the school for the destruction of the illusion in which a man is enveloped during physical life. [page 87] As long as the soul dwells in the body it shares all that concerns it. The inner surge of attraction and repulsion is bound up with the body. It causes the soul's feeling of well-being "feeling of self is based upon this fact. And the more people live in the sense-life, the more does their feeling of self take on this characteristic. After death the body, the object of this feeling of self, is lacking. On this account the soul, which still retains the feeling, has the sensation of being, as it were, hollowed out. Anyone convinced that true being resides in the physical before dying will have a tough battle overcoming and passing through this region. When we leave this region we have lost our notion, which is an illusion, of a bodily self. The fifth is the region of Soul-Light, where we must undergo the process of losing the delight and pleasure we took in our surroundings in the physical world. Steiner gives us several examples, one of a seemingly religious-natured person. [page 89] Those souls also who seek from their religious observances mainly an enhancement of their sensuous welfare, whether it be that their longing goes out to an earthly or a heavenly paradise, are purified here. They find this paradise in the Soul-land, but only for the purpose of seeing through its worthlessness. In the sixth region of Active Soul-Force, people with seemingly idealistic natures have difficulty. He gives us the example of artists with a scientific bent who obtain sensuous feelings of pleasure in their work. With passage through the seventh region, Soul-Life, we are freed from our last attachments to the physical world. Here are the resolute materialists who think almost completely of the events in the physical world. [page 90] There the souls see that no objects exist in true reality for materialistic thinking. Like ice in the sun this belief of the soul melts away. The soul-being is now absorbed into its own world; the spirit, free from all fetters, rises to the regions where it lives in its own surroundings only. The soul has completed its previous earthly task, and after death any traces of this task that remained as fettering to the spirit, have dissolved. By overcoming the last trace of the earth, the soul is itself given back to its own element. We have seen how the soul links the physical to the spiritual in the nature of man (Chapter I) and now we see how these attachments are systematically removed and with it the soul dissolves away. We discover, like in the story of the Tar Baby, the deeper we push our hands ourselves into the sticky stuff of physicality, the longer it takes our souls to pull away. [page 90] One sees from this description that the experiences in the soul-world, and also the conditions of soul-life after death, assume an ever less repellent appearance the more man has shaken off those elements adhering to him from his earthly union with the physical corporeality and immediately related to his body. The soul will belong for a longer or shorter time to one or another region according to the conditions created in its physical life. Where the soul feels itself to be in affinity, there it remains until the affinity is extinguished. Where no relationship exists, it goes on its way without feeling the possible influences. When we enter Spiritland we encounter the phenomena of spiritual sight and spiritual hearing. With spiritual sight we are able to perceive what Carl Jung called "archetypes" as living spiritual beings. [page 92] Just as the environment of a man born blind and then operated upon appears all at once with the new qualities of color and light, so is the environment of the person who learns to use his spiritual eye seen to be filled with a new world, the world of living thoughts or spirit-beings. There are to be seen in this world, first the spiritual archetypes of all things and beings which are present in the physical and in the soul worlds. Imagine the picture of a painter existing in the mind before it is painted. This indicates what is meant by the expression 'Archetype'. It does not concern us here that the painter has not, perhaps, had such an archetype in his mind before he paints; and that it only gradually develops and becomes complete during the practical work. In the real World of the Spirit, there are such archetypes for all things, and the physical things and beings are images of these archetypes. With spiritual hearing, we are able to hear what has been called the “Music of the Spheres” since the time of classical Greece. The first region is the foundation of Spiritland and contains archetypes of the minerals and other portions of the physical world that are not endowed with life. These archetypes fill the space between physical bodies with their fluid activity. The second region of Spiritland contains the archetypes of life and could be called Flowing Life. "In this element are the creative Primal Forces producing everything that appears in physical reality as living being." (Page 95) The third region contains the archetypes of whatever is of the nature of soul. This is a rarified region that could be called the atmosphere of Spiritland. Steiner waxes poetical in his description of the airy third region. [page 95, 96] The atmospheric processes in this aerial region correspond with the sorrows and joys of the creatures in the other worlds. The longing of a human soul appears here as a gentle zephyr; an outbreak of passion is like a stormy blast. One who can form conceptions of what is here under consideration, pierces deep into the sighing of every creature when he directs his attention to it. One can for example speak here of storms with flashing lightning and rolling thunder; and if one investigates the matter one finds that the passions of a battle waged on earth are expressed in such spirit tempests. To enable us to understand what happens to humans in Spiritland during the time between death and a new birth, Steiner offers us the analogy with an architect and contractor. The plans for the house are drawn up in the architect's office, not on the site of the house and not by the laborers who will build the house. In Spiritland, we operate as an architect, while on the physical plane we live in the structure which is filled with the capacities and abilities we had planned for ahead of time. [page 98, 99] The spirit of man has always to live again in this realm between two incarnations in order, equipped with what he brings with him from there, to be able to tackle the work in the physical life. As the architect, without working with brick and mortar, designs the plan of the house in his work-room in accordance with architectural and other laws, so has the architect of human activity, the spirit or Higher Self, to develop in the Spiritland its capacities and aims in accordance with the laws of that land, in order then to bring them over into the physical world. Only if the human spirit sojourns over and over again in its own region, will it also be able to bring the spirit, by means of the physical corporeal instruments, into the earthly world. In a world without reincarnation, how can the evolution of the human being arise? Certainly the physical traits may change over time according to the strictures of darwinian evolution, but what about the evolution of consciousness? An architect learns from designing, building, and living in one house, and is thereby able to create a better house next time. Humans during their sojourn in Spiritland act as exactly such an architect which builds not better houses, but better human beings. [page 99] In the intervals between the incarnations, the spirit lives in its own sphere. It can give itself up entirely to the requirements of the spirit-life; freed from the physical body, it develops in every direction, and works into this development the fruits of its experiences in former earthly lives. Thus its attention is always directed to the scene of its earthly tasks; thus it works continually at following the earth, in so far as that is its present field of action, through its necessary development. It works upon itself, so as to be able in each incarnation to carry out its service during that life in accordance with the then condition of the earth. It should be kept in mind that humans tend to reincarnate after a long enough period of time so that the conditions on the Earth have changed. This makes the new incarnation a challenge and requires adjustments by the spirit to conditions which are only developing. This process gives each new generation a serious challenge both when they are in Spiritland planning for the new incarnation, and later when they arrive on Earth. This is especially so when they discover how drastically conditions of environment and culture have changed since their previous incarnation. For this reason, successive incarnations may not always be more nearly perfect than the previous. [page 100] Circumstances may bring it about that a subsequent life of a man is much less perfect than a previous one. But taken as a whole such irregularities equalize themselves within definite limits in the succession of lives. There is a Grand Pronouncement from the Chandogya Upanishad, "Tat tvam asi," which translates as "Thou art that." The ancient sages of India possessed during their earthly lifetime the knowledge expressed by this statement that they were related to all things. Others then and today can only experience this as direct knowledge during their time between death and a new birth. For most people this is simply an amorphous thought meaning very little, up until now. [page 101] We see that what is grasped during earthly life as a shadowy thought, towards which all wisdom strives, is, in the Spiritland, an immediate experience. Indeed, it is only thought during the earth-life because it is a fact in the spiritual existence. Human beings have the possibility to grow spiritually with each incarnation. This process is so valuable that it argues of itself for the existence of reincarnation as a reality. Steiner gives us a précis of a human life to show how one may become perfected from lifetime to another. [page 102] On earth man is born into a family, a race: he lives in a certain country. His earthly existence is determined by all these relationships. He finds this or that friend because relationships in the physical world bring it about. He carries on this or that business. All this decides the conditions of his earthly life. All this now presents itself to him during his life in the first region of Spiritland as living thought-reality. He lives it all through again in a certain way. But he lives it through from the active spiritual side. The family love he has extended, the friendship he has offered, become alive from within, and his capacities in this direction are enhanced. That element in the spirit of man which works as the power of love of family and friend is strengthened. He enters again on his later earthly existence a more perfect man in these respects. One of the questions one hears about dying is, "Will I get to see my family and friends who have died?" Steiner explains that we begin in the first region to meet our closest friends, and in the second we expand this to those we are tied to more loosely. [page 103, 104] Whereas in the first region we are together with those souls with whom we have been linked by the closest ties during the preceding physical life, in the second region we enter the domain of all those with whom we felt ourselves to be united in a wider sense: through a common reverence, through a common religious confession, and so on. It must be emphasized that the spiritual experiences of the preceding regions persist through the subsequent ones. Thus a man is not torn away from the ties knit by family, friendship and so on, when he enters upon the life of the second and following regions. Moreover the regions of the Spiritland do not lie like divisions apart from each other; they interpenetrate each other, and man experiences himself in a new region not because he has outwardly entered upon it in any form whatever, but because he has attained in himself the inner capacities for perceiving that within which he previously lived without perceiving it. When I attended events led by Jean Houston back in the 1970s, she would talk about people having "leaky margins" and by this meant that what one person thought about broadcast itself out into the world. This seemed a little hard for the physicist in me at the time to accept, but I took it on faith as referring to some reality that I would discover more about later(14). Here is the later: Steiner explains how thought flows from one person to another. [page 120] The content of a thought lives as such only in the soul of the thinker; but this content activates effects in the spirit-world. These are the perceptible processes for the eyes of spirit. The thought steams out as an actual reality from one human being and flows to the other. In the final section of Chapter 3 on "Thought-forms and the Human Aura" Steiner describes the colors that are visible in the human aura under various conditions(15). He points out that there are three human auras which can be discerned. [page 126] The higher stage of the gift of seeing consists in a person's being able to see all three auras and for the purpose of study to direct his attention to the one or the other. The threefold aura is the supersensibly visible expression of the being of man. The three members: body, soul and spirit, come to expression in it. The third aura comes into prominence the more a person has perfected himself over many incarnations, such as Jesus of Nazareth or the Buddha. One can understand that the aureoles portrayed in artworks surrounding the heads of saints and divines have their origin in an actual perception of their three auras. [page 126, 127] And the more a man proves himself to be a 'Servant of the Eternal', the more does the wonderful third aura reveal itself, that part which bears witness to how far the human being has becomes a citizen of the spiritual world. For the divine Self radiates out through this part of the human aura into the earthly world. In so far as human beings reveal this aura, they are the flames through whom the Divine illumines this world. They show through this part of the aura how far they know how to live not for themselves but for the eternally True, the nobly Beautiful and Good; how far they have wrung from their narrower self the power to offer themselves upon the altar of the great World Process. Thus what the man has made of himself in the course of his incarnations comes to expression in the aura. The complete absence of mystical mumbo-jumbo in Steiner's works adds to his credibility. He asks for healthy human reason to absorb the spiritual facts and decide for itself if it makes sense. He even warns others away from mystical exercises. [page 131, 132] This healthy comprehension should be considered a far better starting-point even for first-hand cognition of the spiritual world, than dubious mystical experiences and the like, which are often imagined to be more valuable than what healthy human understanding can recognize when confronted with the findings of genuine spiritual research. [page 135] One who in face of each thing or event in the world yields himself up to the pleasure or pain which they cause him, is enmeshed in this over-valuation of himself For through his pleasure and his pain he learns nothing about the things, but merely something about himself. [page 137, Theosophy 1855841312] The pleasure should only be an intimation to me that there is in the thing a quality calculated to give pleasure. This quality I must learn to understand. If I go no further than the pleasure, if I allow myself to be entirely absorbed in it, then it only feeds my own pleasures; if the pleasure is to me only an opportunity to experience a quality or property of a thing, I enrich my inner being through this experience. To the seeker, pleasure and displeasure, joy and pain, must be opportunities for learning about things. The seeker does not thereby become blunted to pleasure or pain, but he raises himself above them in order that they may reveal to him the nature of things. He who develops in this respect will learn to realize what good instructors pleasure and pain are. He will feel with every being and thereby receive the revelation of its inner nature. The seeker never says to himself merely, 'Oh, how I suffer!' or 'Oh, how glad I am!' but always 'How suffering speaks!' 'How joy speaks!' He eliminates the element of self in order that pleasure and joy from the outer world may work upon him. By this means he develops a completely new way of relating himself to things. The above passage is one that I chose to compare the translations in my two copies of Theosophy — this copy and the one for my 1996 reading. My plan for this re-reading was to use the other as a cross-reference for difficult passages. Finding no difficult passages, I chose a beautiful passage instead — the one above. Finding the matching passage was not easy, but here it is. Read it and compare it to the one above. One could choose to be pained that, as an English speaker, one is unable to read Steiner in his original German, or, one could find pleasure in having multiple translations each of which infuses added meaning to what he originally wrote. One could even apply the lesson of the two passages to find opportunities for learning about things instead — for asking "what that joy or suffering has to tell us". [page 184, Theosophy 0880103736] In the course of our research, pleasure and displeasure, joy and pain, must present us with opportunities to learn about things. This does not make us immune to pleasure and pain; it enables us to rise above them so that they can disclose the actual nature of external things. By cultivating this faculty, we will come to realize what good teachers pleasure and pain are. We will co-experience what each and every being feels and thus receive a revelation of its inner nature. If we are truly seeking, we never stop short at our own suffering or pleasure, but always ask what that joy or suffering has to tell us. We surrender our personal selves so that suffering or pleasure coming from the outside world can work on us. The one passage I will remember from the two versions is "How suffering speaks!" and "How joy speaks!" from the first one, the one from the book I luckily chose to read and review. One might think of multiple translations as looking at a tree from multiple directions, as Steiner himself has said in various places when discussing how to expand one's personal view of objects or issues of any kind. If Steiner were here in my fingers typing, he might also remind us that his original German of the passage is but another view of the tree! The tree we are looking at is not Steiner's original words, but instead the reality that his German words were pointing at. So through our pains of reading both the passage above and the pleasure we took in comparing the two, we have a received a revelation of their inner nature exactly as Steiner promised we would(16). Why is any of this important? Does it pain you to know why? When you find out will you have pleasure? Or will both the pain and the pleasure morph into organs through which revelation of the soul-world reaches you? [page 138] When a man uses pleasure and displeasure in such a way that they become organs of transmission, they build up within his soul the actual organs through which the soulworld reveals itself to him. The eye can serve the body only by being an organ for the transmission of sense-impressions; pleasure and pain become eyes of the soul when they cease merely to have value for themselves and begin to reveal to a man's own soul the soul outside it. In this next passage, Steiner uses an interesting phrase, "favorite thought." If you are familiar with the work of Thomas Kuhn, it may occur to you that scientists have "favorite thoughts" about their particular field at a given time in history, such as Newton's laws, and then at a later time, they replace or supplement those favorite thoughts with new favorite thoughts, such as from Einstein's theory of relativity. Kuhn used a then-obscure word, paradigm, to talk about Steiner's concept of favorite thoughts some fifty years later(17). How dry it seems to convert all suffering and joy into some mere lessons of life! Is that what Steiner is asking of us? To sacrifice ourselves our life-long simply for some knowledge? This will seem useless only from the perspective of someone who sees this one lifetime as the only lifetime. This may have been a useful perspective for humans to have over the past 2,000 years, but it is outdated and should be discarded with the knowledge of how human beings evolve over many lifetimes(18). [page 142] As long as a man lives wholly in joy and pain he cannot gain knowledge through them. When he learns how to live through them, when he draws out of them his feeling of self, then they become his organs of perception; then he sees by means of them, cognizes by means of them. It is incorrect to think that the seeker becomes a dry, colorless being, incapable of joy or suffering. Joy and suffering are present in him, but — when he investigates in the spiritual world — in a different form; they have become 'eyes and ears'. The crucial aspect of all this comes when we understand that we humans have a non-transitory part of ourselves, our "I", to which all the transitory parts of ourselves act as intermediaries. [page 142, 143] As long as we live in a personal relationship with the world things reveal only what links them with our personality. But that is the transitory part of them. If we withdraw ourselves from the transitory nature and live with our feeling of self, with our 'I', in our permanent nature, then the transitory parts of our nature become intermediaries; and what reveals itself through them is an Imperishable reality, an Eternal reality in the things. This relationship between his own Eternal nature and the Eternal in the things must be established by the seeker. Even before he begins other exercises of the kind described, and also during them, he should direct his thought to this Imperishable aspect. Over the past several years, I have begun to take particular notice of the tiniest flowers and insects around our home and its grounds. Wild flowers and bugs of under a centimeter (half-inch) in size which, when recorded with a macro lens and brought to viewing size, shine into view with a freshness as if we had never these objects which we may step on, avoid, or swat on a daily basis(19). I didn't consider my photography as a spiritual exercise, up until now. [page 143] Every leaf, every little insect, will unveil to us innumerable mysteries when not our eyes only, but through the eyes the spirit is directed upon them. Every sparkle, every shade of color, every cadence, will remain vividly perceptible to the senses; nothing will be lost; an infinitude of new life is gained in addition. Indeed a person who does not understand how to observe with the eye even the tiniest thing will achieve only pale, bloodless thoughts, not spiritual sight. This review constitutes my short summary of Steiner's Theosophy and even shorter summary of his "Path to Knowledge" in Chapter IV. I don't know exactly where I am on that path to knowledge, but I find bread crumbs left behind for me to follow by Rudolf Steiner who definitely was on that path. Each book of his I read drops several more bread crumbs on my path to follow. I found it necessary to read more deeply this introductory book because it contained some key bread crumbs I needed to progress on my own path. I threaded my way through his Occult Science — An Outline without having fully digested what he tells us in its introduction or prefatory material, this book, up until now. [page 146] No further description of the path will be given here. It is contained, as far as is possible, in my Occult Science — An Outline which forms a continuation of this book. There is nothing for me to do but to await the unfolding of the spiritual world to my perception. [page 145] He who is able to work upon his inner life in such a way advances from stage to stage in spiritual knowledge. The fruit of his exercises will be that certain vistas of the supersensible world will unfold to his spiritual perception. He learns the meaning of the truths that are communicated about this world; and he will receive confirmation of them through his own experience. 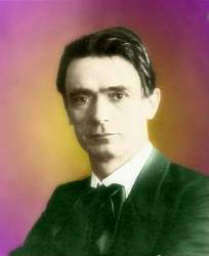 But Rudolf Steiner leaves us a huge challenge. We bask in the fountain-head of light, which he remains for all generations to come, a conscious image of the Eternal verities which he has become for us. [page 145, 146] The light of knowledge does not henceforward shine upon him from without but he is himself placed in the fountain-head of this light. The problems which the world presents receive new illumination. Henceforth he no longer holds converse with the things which are fashioned through the spirit, but with the forming Spirit itself. The separate life of the personality only exists now, in the moments of spiritual knowledge, in order to be a conscious image of the Eternal. You, reading this now, on your own path to spiritual knowledge, can transcend the things of the personality, rise above the pain and pleasure of life to stimulate your organs of spiritual perception, and become, as Steiner, in your moment of spiritual knowledge, a conscious image of the Eternal. Footnote 1. See passage from page  for the two translation examples. Footnote 2. Steiner explains that animals have a soul, but only a group soul for each species to which they belong. By that criteria alone, that a species have a soul, each human being is a species unto itself. Herein is the rationale for distinguishing the human kingdom from the animal kingdom. It is a spiritual distinction, not a biological distinction because materialistic biology calls everything higher than a plant, an animal. Footnote 3. In my discovery of the Remember the Future process, I came to understand that information from the future is revealed to us by a feeling. Thus the seemingly unscientific process of human feeling can be the basis upon which to make important life decisions. Footnote 5. See Nicholas Humphrey's book on this subject, Seeing Red.In this book, subtitled, "A Study of Consciousness," Humphrey stumbles upon the concept of soul, something that, as a scientist, he might find remarkable and unexpected. Footnote 6. See Gabriele Finaldi et al's The Image of Christ for evidence of how the Church changed after the spirit was dropped from the full human being, who was thereafter relegated to a being of body and a soul, which supposedly had some aspect of spirit. The author of this book, long after it was written, applied to what is here called etheric or life-body, the name 'formative-force-body'. He felt moved to give it this name, because he believes that one cannot do enough to prevent the misunderstanding due to confusing what is here meant by etheric body with the 'vital force' of older natural science. Footnote 8. In a footnote to page 32, it is made clear that while animals have a form of thinking, each animal hasnot an independent ego as each human possesses, but instead exists as a part of a group-ego. Footnote 9. This paragraph, for example, was triggered by my marginalia at the very top of page 48, "My Reviews". Footnote 10. This process seemed to be a surprise to researchers who found that false memories were being created in the process of psychotherapy during the last decades of the twentieth century. This went counter to the expectations of the scientific researchers who didnot understand the very process Steiner was describing back in 1912 in pages 49 and 50. This is evidence that Steiner's worksextend ordinary science, and that all scientists, whatever their field, would do well to study his works. Footnote 11. Nature's Open Secret is the first book in Rudolf Steiner's Collected Works, GA# 1. Footnote 12. I have written about Virgil in these four reviews: Truth and Knowledge and A Psychology of Body, Soul, & Spirit by Rudolf Steiner, Bright Colors, Falsely Seen by Kevin Dann, and What is Man? by Edward Reaugh Smith. Footnote 13. Exactly what Virgil reported seeing when his vision was restored as an adult. Footnote 14. Holding Jean's concept of leaky margins as an unanswered question, Del and I began to notice how one of us would begin talking about what the other one was simultaneously thinking about. We came to understand that the thought flowed up in both of us at the same time, but one or the other would put it into words first — that "It all happens at the same time. Return to text directly before Footnote 14. Footnote 15. Any reference to the colors is omitted in this review. Steiner's caveat on page 129 explains why, "This presentation has nothing whatever to do with a reading of character or of a man's thoughts from an aura perceived in an hallucinatory manner. It seeks to expandknowledge in the direction of the spiritual world and will have nothing to do with the questionable art of reading human souls from their auras." Return to text directly before Footnote 15. Footnote 16. If this process I used of applying an insight to a passage which provides an insight seems a little strange to you, you might want to read about DIRAK! which is Matherne's Rule #7 Do It Right Away, Kid! Return to text directly before Footnote 16. Footnote 17. See Thomas Kuhn's now classic work on paradigms, his book, The Structure of Scientific Revolutions. Return to text directly before Footnote 17. Footnote 18. Steiner writes elsewhere that the knowledge of reincarnation was intended by Christ Jesus to remain a mystery for 2,000 years so that we humans would learn to make the best use of our present lives on Earth. We were destined to make progress in the physical domain during this period of time. The alcohol in the wine in sacraments acted to turn off direct perception of the spiritual reality of reincarnation in the early Church leaders, and led to their destroying most records of the gnostics, among others, who wrote of reincarnation as a spiritual fact.See The Soul's Long Journey by Edward Reaugh Smith for how the Bible reveals incarnation. Return to text directly before Footnote 18. Footnote 19. In my Good Mountain Press Digest, I include some of the more remarkable of these tiny flowers. There is even a regular feature called Don't Bug Us which usually highlights some unusual or strikingly beautiful bug, often a very tiny one, such as the one in this issue. Return to text directly before Footnote 19.